Burke Teichert, BEEF magazine columnist and retired ranch manager, is the keynote speaker for NDSU's Business of Ranching workshop. Photo courtesy NDSU Extension. The North Dakota State University Extension Service is holding a Business of Ranching workshop June 13 to help early career ranchers and others gain the knowledge they need. The workshop will be from 10 a.m. to 4:30 p.m. at NDSU's North Central Research Extension Center south of Minot. BEEF magazine columnist Burke Teichert will be the keynote speaker for the event. Drawing on his expertise and experience, Teichert will share his ranch planning ideas and discuss how to organize ranches to be cost-effective and successful. He was raised on a family ranch in western Wyoming. 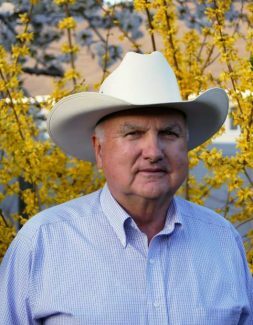 His work history includes serving as a university faculty member, cattle reproduction specialist and manager of a number of large ranches. Before retirement, he was manager for seven of the ranches owned by Deseret Land and Cattle. Teichert will open the workshop with his approach to planning strategically for success, which is to use a production system that controls operating and overhead costs. He also depends on ingenuity and inventiveness to maximize the value of soil, sunlight and rainfall. Components he will discuss include the right cows, scheduling the herd, managed time-controlled grazing, simplicity and flexibility, continued marketing and analysis. He also will speak at a second session that focuses on essential information such as decision-making tools, keys to success and reasons ranches fail. Steve Metzger, North Dakota Farm Business Management instructor, will discuss the cost of owning cows and equipment, using information obtained from ranches participating in the financial analysis program and his considerable experience in helping producers evaluate their cow-calf enterprises. Metzger will review profit potentials, and production and financial benchmarks, to help participants set business goals and targets. Dwight Aakre, NDSU Extension farm management specialist, will explain how producers should determine and evaluate the associated operating and depreciation costs in a ranch. High equipment and breeding stock costs will be a challenge to manage and control, he says. Ryan Larsen, an assistant professor in the NDSU Department of Agribusiness and Applied Economics, will speak on the capital and financing requirements of ranching businesses. Sources of borrowed money, debt structure and appropriate debt level are all critical to business success. Larsen will share guidelines on how finance and debt should be evaluated and managed. Ray Erbele, a rancher in the Streeter area and an active partner in the Napoleon Livestock Auction, will share his thoughts on how to strategically produce for the market and capture value. He says that managing a cow-calf operation profitably requires continued focus on marketing to manage price risk and maximize value. Amber Boeshans, livestock development specialist for the North Dakota Department of Agriculture, will talk about the goal of increasing and diversifying the state's livestock and dairy industries by providing support to producers, commodity groups, producer cooperatives and processors. For more information on the workshop or a registration form, visit http://www.ag.ndsu.edu/cattledocs or http://www.ag.ndsu.edu/wardcountyextension. The cost of attending the workshop is $75. That includes a break and lunch. The first 40 people to register will receive a $50 reimbursement through a grant from the North Dakota Corn Council. The registration deadline is June 6. Make checks payable to the NDSU Extension Service, Ward County, and send registrations to Paige Brummund, Extension agent, at NDSU Extension Service, Ward County, P.O. Box 5005, Minot, ND 58702-5005.